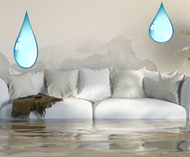 Water damage to your home can result from storms, leaks, overflows, and backups. When you are dealing with water damage, it's important to take action right away! Following flood damage or other water damage events, mold growth is a very real concern, especially in the warm climate in San Diego. If you have recently had water damage from a burst pipe or flooding rains, call UK Cleaning immediately! Whether the water is from weather-related events, or leaking appliances and plumbing, or overflowing basins or sewer backups, UK Cleaning works together with a trusted water restoration company to help restore your property from the damages of water and prevent mold growth. We have the expertise and resources to remove the water, and to dry the damaged area properly.